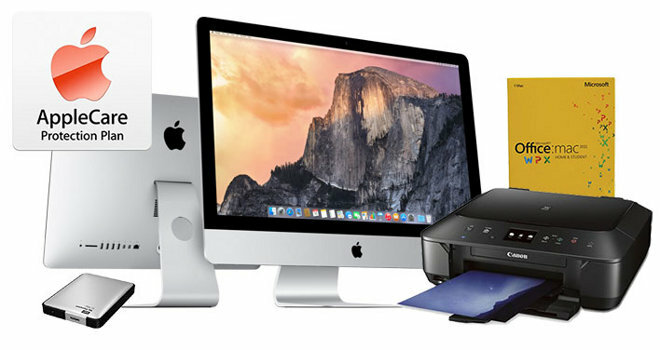 For a limited time, AI readers can save up to $219 on Apple's iMac 5Ks plus get a free copy of Microsoft Office for Mac (or a free combo of a 1TB WD My Passport Drive & Canon all-in-one AirPrint Printer). Each also includes a free LG super drive, a free 3-piece Corel Creative Suite, free shipping and no sales tax collected in 48 states. There are two options for taking advantage of this offer from Apple authorized reseller Adorama and AppleInsider: you can just purchase an iMac 5K or you can purchase iMac 5K with AppleCare. Regardless of which one you choose, the discounts themselves deliver the lowest prices anywhere for 95% of the configurations (before the free items are factored in.) Both buying scenarios also offer the same free options: a free copy of Microsoft Office or the free combo of a 1TB WD My Passport Drive & Canon PIXMA MG6620 AirPrint Inkjet Photo all-in-one printer. In addition, each also includes a free LG super drive & 3 piece Corel Creative Suite. So in total, you will receive either 3 or 4 accessories completely free. The Microsoft Office box that will ship with these iMac 5Ks will include only a product license key and instructions on how to quickly download Microsoft Office 2011 for Mac. This is the latest copy of Microsoft Office for Mac that customers can buy once and own forever, as the version introduced this year (Office 360) requires an ongoing subscription to remain functional. Of course, each iMac 5K will also ship completely free with no sales tax collected on orders that ship outside of NY & NJ. Step-by-step instructions for taking advantage of these offers are included below. The first set is for readers looking only for an iMac 5K without AppleCare, while the second is for those who want to purchase a total of 3 years of AppleCare extended protection at the time of their purchase. Use the instructions below to purchase an iMac 5K with a free LG super drive, free Corel Creative Suite and your additional choice of 1) Microsoft Office 2011 for Mac or 2) the combo of a 1TB WD My Passport Drive & Canon PIXMA MG6620 AirPrint Inkjet Photo all-in-one printer. Below are Apple's two standard retail configurations of the iMac 5K, which are also the most popular models. They are followed by dozens of BTO configurations and the step-by-step instructions. 4) Once logged in, select your iMac 5K configuration by using our Mac Price Guide and click the pricing link under the Adorama column (or use the links below these instructions). 5) When the Adorama iMac 5K page loads, you'll see a price that's higher than advertised. That will be addressed in a moment. 6) Right below the price of the iMac 5K is a section that says "Ways To Save up to $140.00." Click the link that says "Save up to $140.00 with bundle.". 7) When the page loads, scroll down to the section that says "Pick 1 FREE or Discounted Accessory!" 8) Now add the free copy of Office or WD Drive & Printer Combo to the bundle using the blue "ADD TO BUNDLE" buttons. 11) After you apply the promo code, the price should fall to match the price currently advertised for this model in our Mac Price Guides. 12) Now complete your order and checkout. Use the instructions below to purchase an iMac 5K + AppleCare with a free LG super drive, free Corel Creative Suite and your additional choice of 1) Microsoft Office 2011 for Mac or 2) the combo of a 1TB WD My Passport Drive & Canon PIXMA MG6620 AirPrint Inkjet Photo all-in-one printer. Below are Apple's two standard retail configurations of the iMac 5K with AppleCare, which are also the most popular models. They are followed by dozens of BTO configurations and the step-by-step instructions. 4) Once logged in, select your iMac 5K + AppleCare configuration by using our Macs with AppleCare Price Guide and click the pricing link under the Adorama column for the model you decide on. 5) When the Adorama iMac 5K + AppleCare bundle page loads, you'll see a price that's higher than advertised. That will be addressed in a moment. 6) Right below the price of the iMac 5K bundle is a section that says "Ways To Save up to $199.98." Click the link that says "Save up to $199.98 with bundle.". The deals above are just a few of the ongoing offers for the back-to-school season. Don't forget to check out our feature article How to get the best prices on Apple's 12" & 13" MacBooks this back-to-school season, as well as Free AppleTVs with 13" MacBook Airs and Free AppleCare with these mid-2015 15" MacBook Pros plus additional discounts.